In 1981, the World Missions Board of The General Council of the Assemblies of God (AGWM) began to realize the importance of media in evangelism and recognized the need for a media-based ministry. David and Jimmie Ruth Lee, Assemblies of God missionaries, after having led a successful radio program in Columbia, were asked to lead the new endeavor. International Media Ministries (IMM) was born as a venue through which to communicate the Gospel using television and radio. In 1985, IMM moved from the David Lee’s garage in Florida to Brussels, Belgium to better serve as a hub for the many surrounding nations. While in Belgium, IMM produced more than 250 programs, and assisted missionaries and churches in building and operating radio and television stations around the world, particularly in Africa and Russia. In 1989 when the Iron Curtain fell and new borders were opened to freedom, IMM was uniquely established to aid nationals in bringing the gospel to their own people using media. David and Jimmie Ruth Lee, founding directors of IMM, on set in Brussels, Belgium. As technology changed, the IMM team began to observe the existence of satellite dishes in extremely remote areas, and realized that the airwaves could bring the hope of Christ to the spiritually lost where access had previously been difficult or restricted. IMM programming could go where missionaries could not and could partner with missionaries and nationals to use media to spread the Good News in new areas of the world. David and Jimmie Ruth Lee led IMM for 17 years. They were followed by John and Ruth Merrell, who came to IMM after working with (now) Global University, where they had served in media missions, and as founders of the Center for Illiterate Outreach. 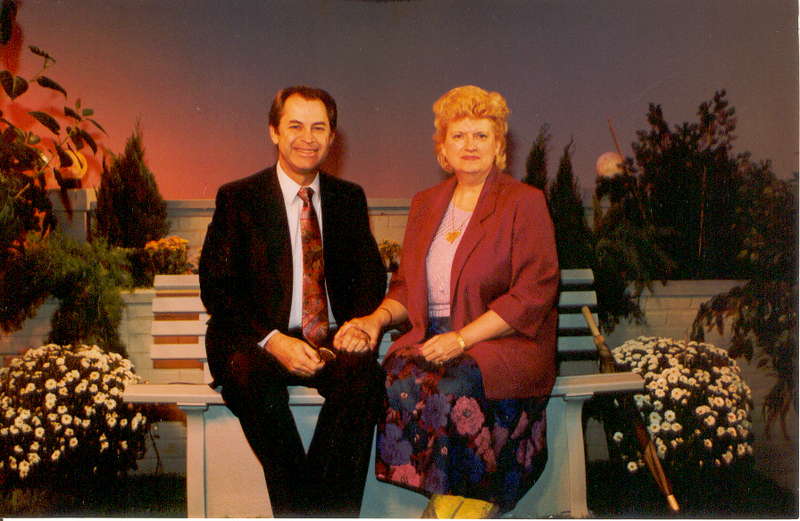 John and Ruth Merrell, directors of IMM from 1998-2009. The current IMM facility in Madrid, Spain, under construction in 2006. In 2002, the Belgium government began to restrict foreign visas and said that IMM could no longer operate in the country. Production closed down for six months and work was finished quietly in staff homes. After much prayer, Director John Merrell decided to accept an invitation to move the ministry to Madrid, Spain. The Spanish Assemblies of God fellowship contributed a large part of the funds needed to move, purchase land and build a facility. Today, that facility holds offices, production facilities, and housing for short term missionaries. The planning, construction and moving of equipment took three-and-a-half years to complete, but the team continued to work in rented spaces to produce several installments of the Bible Stories Video Series, which is now licensed in more than 20 languages and has been seen around the world. Staff in IMM's temporary offices in Los Hueros, near the current facility, in 2004. Jerry and Gwen Gibson, directors of IMM from 2009-2013. Jerry and Gwen Gibson were next to come lead the IMM team. Jerry came from a missions and university background and envisioned a new way to evangelize through media. The purpose of IMM shifted to include different ways of production, training, and mentorship of new generations in media and missions. Broadcasting, internet, satellite, short spots, dramas, docu-dramas, and training were included to make Christ known to more people in more cultures. Current Team Leaders Kerry and Denise have been part of the IMM team for more than 12 years. Kerry continues as Art Director and works in production, while Denise moved into the role of Director after being Production Manager during the Gibsons’ tenure. The team currently consists of full-time missionaries, missionary associates, and interns with university, training, IT, and media backgrounds. Denise Godwin, current director of IMM, and her husband Kerry at the premiere of Tamar in 2016. Former IMM staff member, Michael Helin, hosting media training with church volunteers, onsite in Madrid, Spain. Today, IMM projects reach into homes and onto mobile screens where people can privately learn of God’s love. Each showing of IMM programs with just one of IMM's broadcast partners saturates 300 million homes at a time. Through the years, IMM has built relationships with broadcast partners throughout Africa, Europe, and Eurasia, and continues as a resource for production and audio-visual training for missionaries and nationals. Programs have been winning people to Christ and connecting them to believers in their own countries. The message has always stayed the same but how IMM accomplishes the distribution of that message changes with each new development in technology. And while media has been in constant evolution, IMM has been able to keep up with the needed equipment, skills and personnel because of the hundreds of people have served as well as the faithful support of Speed the Light and BGMC.